Again, I hope I explain this correctly. If you know I'm wrong please speak up. Here are two lo-speed jets. The one on the left is OEM (11-163S). The one on the right is an aftermarket custom made jet. I found that jet, along with some hand-made accelerator pump spring retention clips, and a custom main jet and rod (among other parts) in my collection of carb parts. 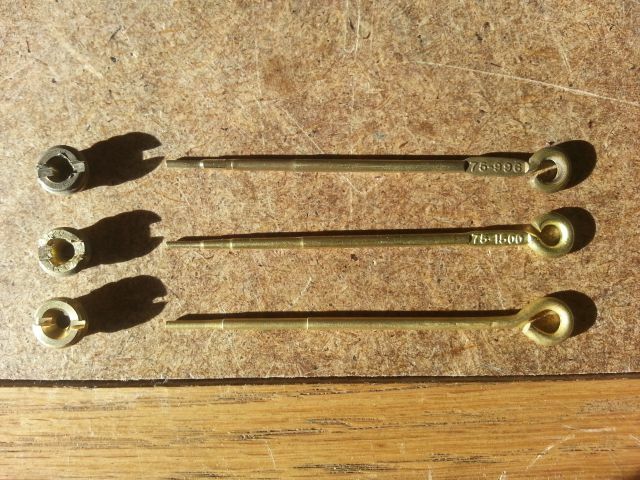 These came from a kit I had on hand and I suspect it was sold by "Mike's Carburetors", as I seem to recall hearing oldtime talk about them having the original Carter Metering Rod making equipment. Here is a view from the other side. A close look reveals a MUCH smaller orifice in the custom lo-speed jet than is found on the OEM jet. I measured .019 on the custom jet and the OEM is .028. The smaller orifice lo-speed jet is interesting, but is subject matter for a subsequent post. For this post we're staying OEM. Now see the spot where that jet lives in the carburetor body? Top left area of the photo. In the fuel body, let your eye follow downward from where the lo-speed jet is placed, and see how it is in kind of a tube? That's the passageway. That passageway goes straight down and ends in the "fuel well" below the main jet (that's the visible jet where the brass metering rod is currently inserted). All the fuel to enter both the high-speed circuit through the main jet, and the lo-speed circuit through the lo-speed jet and its long fuel pick up tube, comes from this same fuel well source, after having flowed from the float bowl into that fuel well through the main jet opening. 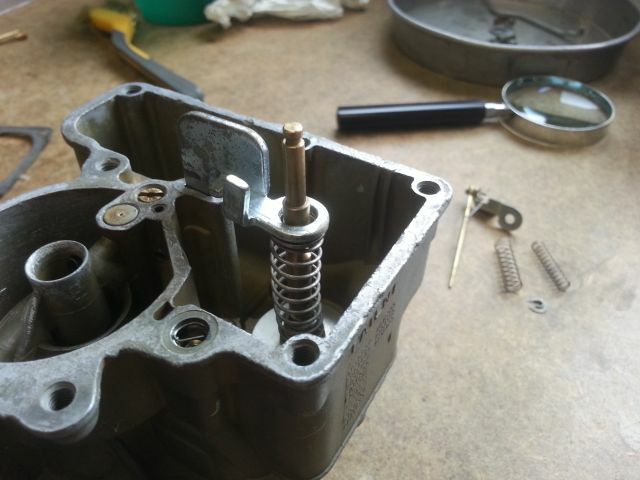 When the carb calls for lo-speed and idle fuel, it flows from the fuel well, upward through the lo-speed jet and out the hole in its top (the slotted screwdriver part). From there it goes back downward through the hole just in front of it in that picture (not the tiny hole in the brass plug piece, but the larger non-metered hole - the passageway hole), and down into the bottom area of the carburetor, to the vicinity of the carburetor throat near the idle mixture screw. Before we leave this upper area and go back downward, note on both your upper fuel bowl body piece and the air-horn body piece are a couple of holes connected to this passageway, and a small orifice in the same vicinity called the equalizer, and these two holes in the throat help balance fuel source and vacuum to make the idle and lo-speed circuit do their thing. Which is magic. The only think to really know here is that these holes all exist, they work together to produce what Carter engineers are trying to express, and that if you clean your carburetor correctly with the Chem-Dip and the high pressure air, you'll be just fine. Now let's go back down. In this next picture you see quite a number of holes. 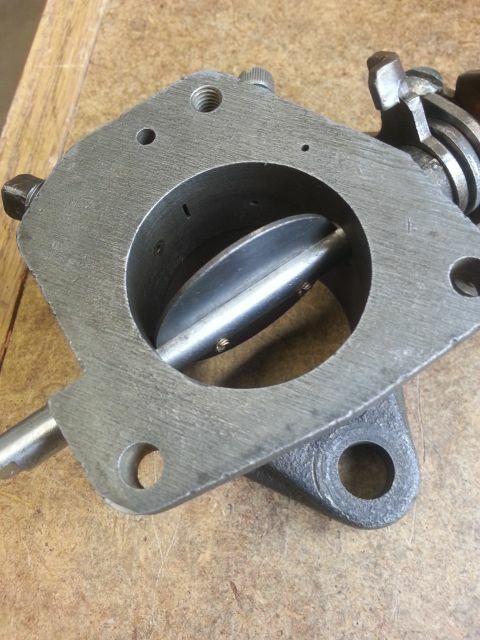 This is the throttle valve body (bottom section of the carb) and it is right side up. First, on the flat machined upper surface, the tiny hole is that manifold vacuum source hole that connects to the bottom side of the accelerator pump diaphragm, the one we discussed previously, that can be blocked by the gasket. 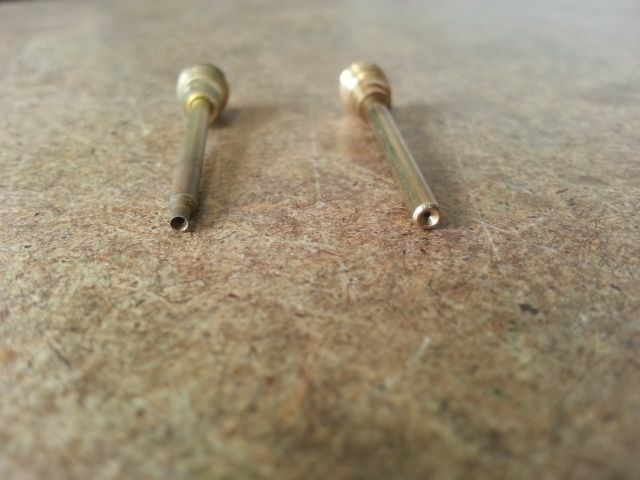 The big threaded hole, and the other two that are the same size and in a triangular pattern, are the holes for the mounting screws that hold the two carb sections together. The last mid-sized hole (on the top machined surface) is a passageway for the idle and lo-speed circuit. That's the hole where we "go back down" to the bottom of the carb from where we were just hanging out up above. 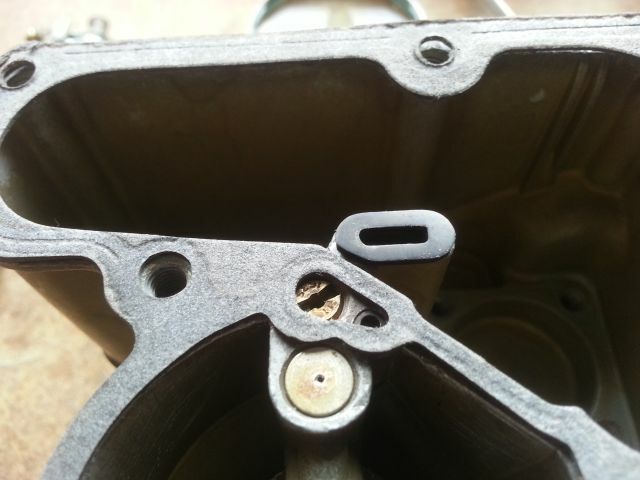 Right below that hole, in the carburetor bore or throat, you see the slotted hole. Yup, part of the lo-speed circuit. To the right of the slot you see a tiny hole; it is the idle mixture screw hole, part of the lo-speed circuit. 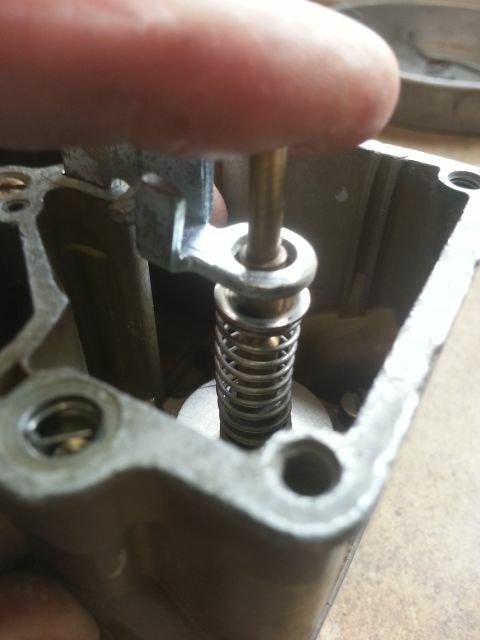 Remember, when you screw the cleaned and inspected idle mixture screw back in with its spring, it has enough pressure on it that it can be difficult to "feel" when it lightly seats in this hole. And when it is lightly seated, its needle point is barely visible in the hole (from the throat side). This is where you need to be careful to not seat it too hard and damage the screw needle surface. It can be fixed if yours has been damaged, or if in your gusto you damage it. But it's soooo much easier to just be aware and to only seat it lightly. Then you back it out 1.25 turns and wait for final idle mixture setting once the engine is running. Now back to the picture - that other tiny hole to the LEFT side of the slot - that is a carburetor vacuum hole. It goes unused and is plugged by the what - 1/8" male pipe thread plug? That's the vacuum source plug right next to the idle mixture screw. I hear some YFs have it and some don't; both of mine have it. THAT hole and passageway are NOT connected to the lo-speed and idle circuit! Now again, all of this is just awareness and kind of knowing that there are many holes associated with the low-speed and idle circuit. It was a surprise to me. I knew the slot had to do with the initial opening of the throttle plate (valve) and that as the plate moves from closed to slightly open, more fuel is allowed to be sucked out through the slot and power the lower speeds of the vehicle. But I guess in the absence of thinking about such things, I had always just assumed the circuit was only dealing with that screw adjustment hole. Doh! Even while remembering my High School mechanics class teachings about that circuit running from idle up to about 30 MPH. (Depends on the carb and vehicle I suppose. I've heard where for these Jeeps it's up through about 20 MPH). This is kind of a short part. I haven't seen it discussed anywhere. So these are my assumptions. As stated before, I think the vast majority of Carter YF rebuild failures for the Jeep are associated with the flooding caused by something like inattention to detail (dirty conditions, mis-adjustments. etc.) or by the fuel valve orifice being too big. 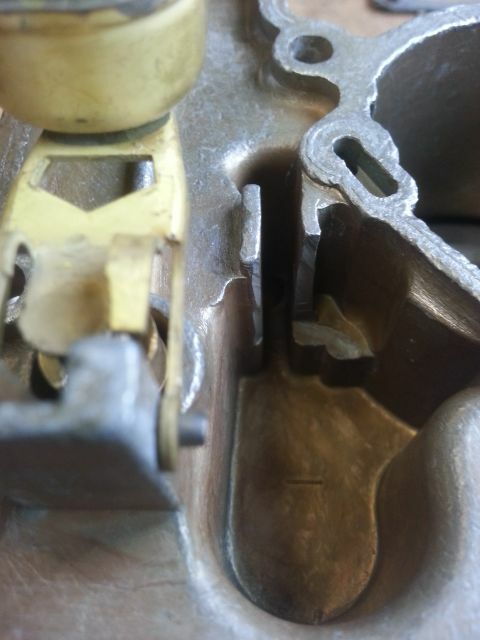 The flooding has been described by displaying various symptoms, one of the most common being a fuel leakage around the exterior of the carburetor base. The big flat metal part in this picture is called the accelerator pump link. It goes through a hole in the fuel bowl body ABOVE the level of full fuel and exits out the bottom. Often, flooding will spill the fuel out that hole and all over the base area of the carburetor exterior. If you would rather keep the fuel from leaking out, and just have it go down the throat of the carburetor where it can enter the engine in liquid form and wash your cylinder walls free of lubricant and dilute your crankcase oil, you should install this little gasket. Seriously, the better solution is to prevent flooding. If you are successful, and you know it, this gasket should be installed because it helps keep contaminants from entering the link housing from below and coming up into the fuel bowl. Is that really an issue? I don't know. But I've always seen these gaskets in the kits, and I've never used them before (because I wasn't sure of best or correct use, and I've never really seen them on the exploded parts diagram) and usually, by the time you get the metering rod adjustment done the carb has been assembled far enough that it MIGHT be inconvenient to take it back apart somewhat to slide on the gasket. But which one to use? It appears that the thin one is too small. The big one is too large. But the middle one, well that's just right! At least that's how I chose - as the story of Goldilocks worked well raising kids! But what's with that angle cut? Here's how I decided it's placement. Now when you put it on the link, and move the link while making adjustments and stuff, it ends up like this. Not to worry. By the time you get the air-horn body put in place, these two upper shoulders on either side of the slot will push the gasket down in place and keep it there. I recommend putting it on the link in the correct placement early in the process, and then just kind of forgetting about it while doing the metering rod adjustments and thereafter. This is pretty important. There is a little metal bracket that the metering rod is hooked onto. That little bracket looks very similar in its shape to the top part of the accelerator pump link. 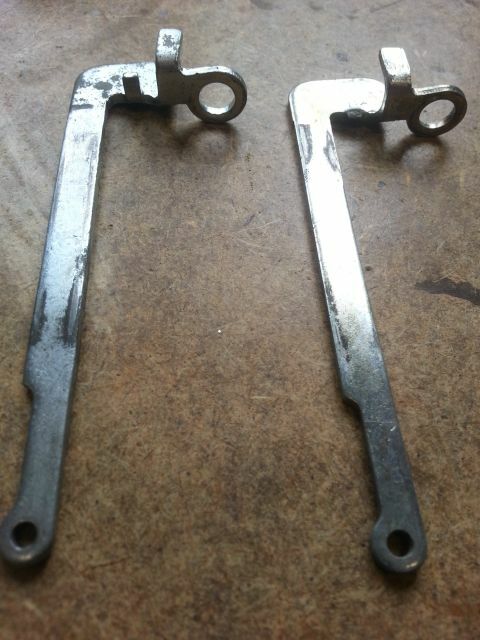 This photo shows my two pump links. Note how there's a missing tab on one (right). It's broke! I don't know how that can happen! But I saved it anyway. And I used the other. Now see how it appears to the plunger on the accelerator pump? This is while holding the plunger down to where it seats in the diaphragm area. Like the manifold vacuum is sucking it down as far as it will go. And it is while closing the throttle valve (which pulls the link down as far as it will go). To do that you have to connect the throttle shaft linkage to the bottom of the pump link. Once that's on, it's harder to decide to take the thing apart to get that little rubber gasket on we talked about above. And I'm glad I kept the gasket (in that post a long time ago) from blocking the manifold vacuum hole because now I don't have to install my finger to do the job. When you release hold down pressure, the lower pump spring pushes it back up like this. Yeah I know. No link gasket. I had to take the bottom linkage off again. Now when you make your metering rod adjustment, the tip of the rod is supposed to seat (gently now) in the bottom of the fuel well below the main jet. If it doesn't, you (ever so slightly and carefully) bend the thin metal between the main part of that metering rod bracket and the little portion that is holding the hoop of the upper metering rod. See that little thin neck of metal? Be careful now. Use needle nose and have control. Then check it again, then relax it to bend, then check again. You get what I mean. And - when it is done right, the two similar looking brackets lie parallel to each other, and on each other, but not in interference with each other (as you work the throttle). All that results in the metering rod starting out its travel upward (as associated with the throttle valve opening), and it only moves in total distance about a half an inch! Just enough to catch three steps on the metering rod: the fat, upper part (economy mode), the middle step (mid range - and that is usually a taper on the metering rod), and finally the lower skinny part (power mode). See- if you try and plug the main jet hole with a fat part, less fuel goes through than if you try and plug that hole with the little skinny part. A really worn carb can give you a main jet whose hole is elongated - that's bad because too much fuel can go through, or a metering rod that displays weird wear, again - too much fuel, both of which mean different fuel metering than the carb is designed for. Here are my rods and jets. The top one displays the best view of a darker color, showing exactly where the rod rides in the jet. Not much distance huh? And this might be a good spot to encourage proper screw-driver fitting to the jets and the fuel inlet valve associated with the float. 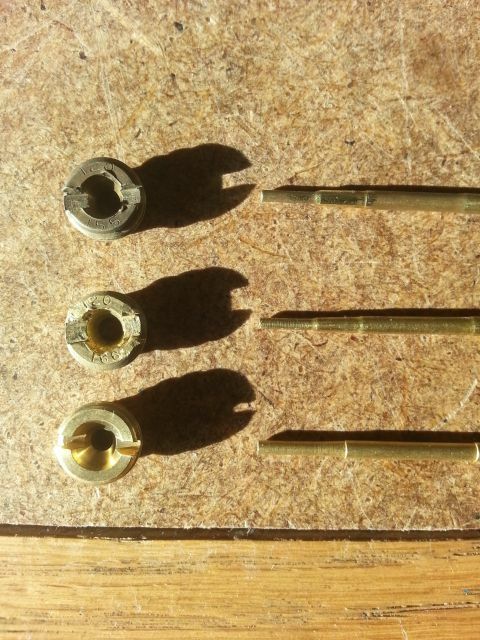 Brass buggers easy and looks are important too! Now my instructions are ONLY meant to help visualize the concept. I highly recommend you make the actual adjustments by following the instructions in the service manual or in the rebuild kit instructions. Oldtime: "I'd like to add some if I may. First one needs to use an appropriate main jet and the corresponding associated metering rod. The rod and jet calibrations are specific to differing YF designations. The 938 S metering parts are not the same as YF 938 SD metering parts. "Correct adjustment of the metering rod to the pump lift link is very important. So it's best follow that procedure exactly as it is described in the USM." Scoutpilot: "With regards to the small rubber gasket for the pump link, there is, and usually missing, a small, thin metal plate of the same size and shape of the rubber gasket. It sits on top of the gasket. 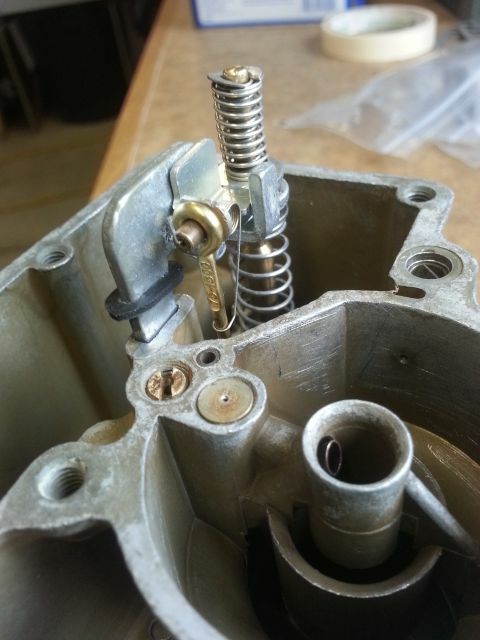 As far as the missing piece from the link, this will explain why -- from Mikes Fuel Parts blog:"
The adjustment below is for early Carter YF carburetors that don’t have an adjusting screw at the top of the metering rod. 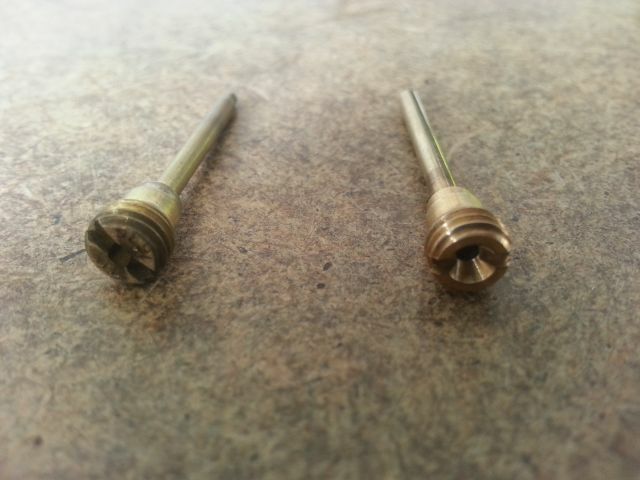 Most YFA carburetors would have the star type of adjusting screw. 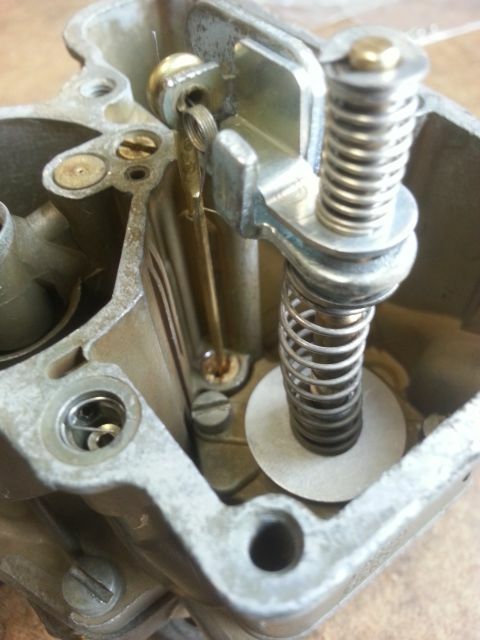 This adjustment is important and should be performed anytime the carburetor is rebuilt, or the metering rod replaced. 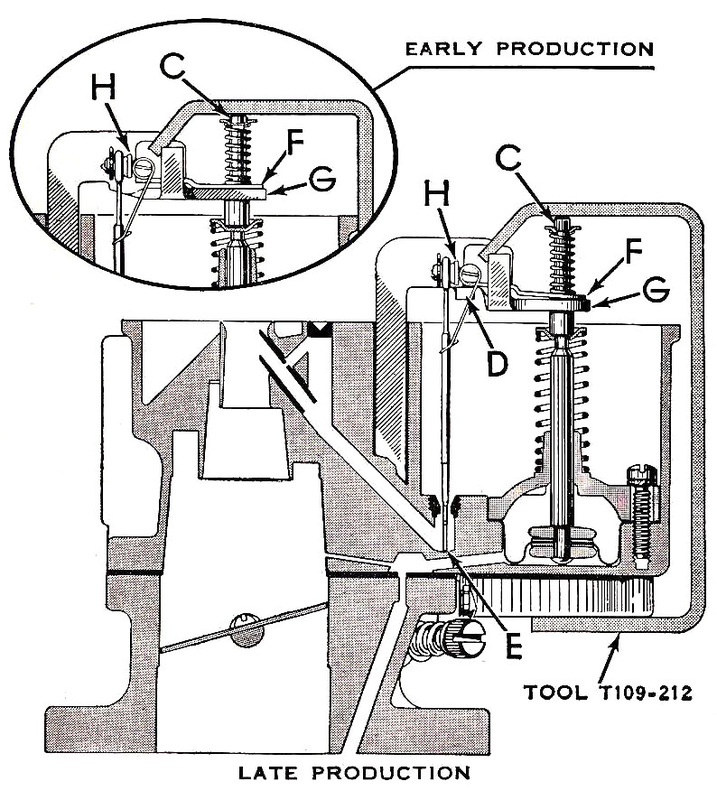 With the throttle valve seated (this means the idle screw is not holding the valve open) in the bore of carburetor, press down on upper end of diaphragm shaft (C) until diaphragm bottoms in vacuum chamber. On carburetors which have the projection (D) on the pump lifter link, metering rod should contact the bottom of the metering rod well (E), and metering rod arm (F) should contact lifter link (G) between springs and at supporting lug (D). Adjust by bending lip (H) up or down. In the illustration there is a tool that can be used to hold down the diaphragm, but chances are you won’t have one of those and it isn’t that big of a deal to hold it down. On models that do not have the projection (D) on pump lifter link, the metering rod should bottom in the metering rod well (E) and flat of metering rod arm (F) should make parallel contact with flat of pump lifter link (G). Adjust by bending the lip (H) up or down. Dave: Thanks scoutpilot. Good to know on the small gasket plate. I see on the broken link. Looks like it's used to adjust the parallel of the two pieces? I was thinking that might be accomplished with the exterior pump link linkage. But I may be thinking of that procedure from some other car. I think the "H" referred to in the link is pointing to where I mention the "thin neck". But it can be several confusing adjustments to somebody doing it for the first time. And that metal can break pretty easy I suppose. Scoutpilot: "No sir. If you read the piece above carefully, you'll see that early pump links did not have the tab at all. And yes, it does take some practice to get the right feel of the rod placement. The tool mentioned in the piece is quite handy in this adjustment." Dave: Thank you scoutpilot. I'll look it over more closely. And this is a good example of how awareness and practice can amount to a better job on the rebuild than just jumping into it. For a shade tree mechanic, that can be somewhat difficult. We all have so many other things in our lives to occupy our minds (and available research time). All the more important to rely to some amount on the more skilled and experienced that online resources have brought to us. But of course we must separate the wheat from the chaff! And as this thread closes in on it's end, I wish to reiterate my appreciation for those like oldtime and scoutpilot who do such a fine job in acting in that skilled position. Thanks guys! And I'd like to mention once more how my observations and comments are just that, a shadetree mechanic's contribution. It's been my desire to simply supply some pictures of the Carter YF, and a little direction to issues in those pictures, and specifically for the 938 series Jeep carburetor. So what about those rods and jets? As it sits, Lil' Willy is running the equivalent of a 938SD, albeit with the check ball/weight/clip as opposed to the check valve. And it's set up with the standard rod (75-1500) and jet (120-166) for sea-level to 5000'. But I live at 5200'. And our wheeling most often takes us UP into the mountains. As high as the San Juans if you've seen some of my other contributions. Take a close look at Carter YF Service Information on CJ3B.info. On the 1961 Spec and Adjustment sheet page two you'll note the 938SD standard metering rod is stepped at this size (in thousandths of an inch) - Economy .0655 - Midrange .057 - Power .04725. That's how large of a diameter the rod is at those points where it comes and goes in the hole of the jet. The jet itself is .0935. Note how, as the rod comes out of the jet hole, the rod gets smaller, moving from economy to midrange to power, thus allowing more fuel as the throttle is opened. This is getting into the "rocket science" mentioned by oldtime (although his comment is about much more than just this). Now I'm not a rocket scientist, but I did spend an afternoon at the Kennedy Space Center once! And I'm not a mathematician, but my High School Geometry Teacher was the football coach and on the day we studied Pi we got extra credit if we slipped into class with a fresh pie. We also got extra credit on Barbara Streisand's birthday, because they went to the same school and dated once. 'Course we four boys in a seating square also learned how to correct our own homework before passing it in too! So when it came to trying to remember how to compute "area" I had to go back to the Internet and do a search. Those who remember off the top of their heads will know that pies are round not square. Cakes can be square, but pies are round. Wrong! Pies are Squared! To figure the area of a circle PiR squared and Pi=3.14. So looking at the hole in the jet at .0935 diameter. Halve that for radius. Then multiply the radius by Pi and square the result (result times result). Pi X R squared. I don't know how to type that little 2 at the top to designate "squared". Correction -- Mathematical order of operations are 1-Parenthesis, 2-Exponents (squares and cubes and powers, etc. ), 3-Multiplication/Division, 4-Addition/Subtraction - meaning what is said later by SteveK - square the radius first, then multiply the result by Pi. 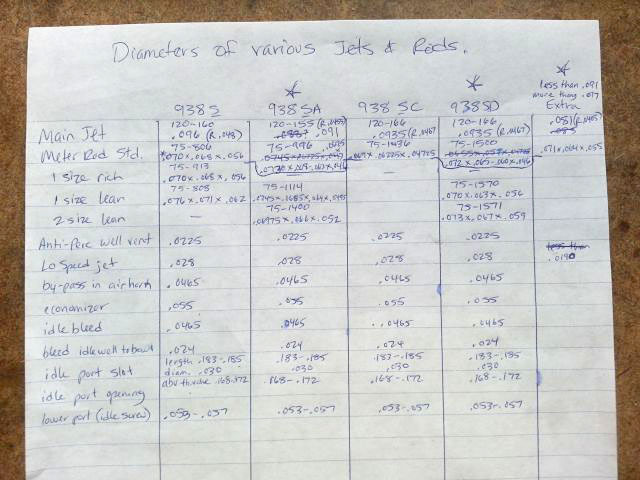 Anyway, I started going to great lengths on notepaper to list ALL the 938S, SA, SC SD rod and jet diameters into "area" of each measurement, in an attempt to visualize the area remaining for each step of a rod inside its jet. And I might re-state oldtime's VERY important message that we DON'T mix and match parts. They are not calibrated to each other except in sets. Don't study that! It's just for illustration. And you might be able to see that not only did I use an incorrect equation along the way (a few times), but that I had incorrect original 938SD standard rod measurements listed, until the very end. 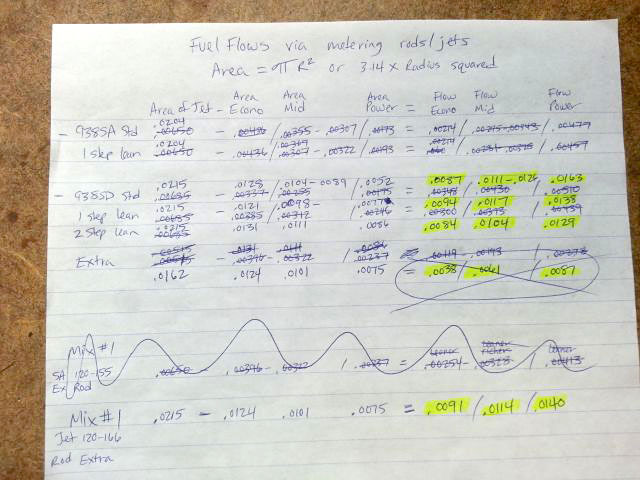 When the fuel flow results "didn't add up", I went back to examine and caught the errors, redid it. Through the process of my computations, I came to a bit of an enlightenment about my "custom" rod, the one that is unlabeled. After careful measurement of it, and the jet that came with it, I have concluded two things. 1 -- The jet and rod are NOT calibrated to one another. They were built as is for TWO separate purposes. 2 -- The rod is essentially the equivalent of a "one step lean" rod for a 938SD, the very carburetor I now have and the rod I need that I didn't have! We've all heard the comment "re-jetting the carb". See, back in the day before electronic chips (chipping) we did similar stuff to our carburetors. But now they are too uncommon to just go down to the corner auto parts store and pick up a new jet or rod. I never did those changes when I was younger, because I couldn't really afford it and I've always been kind of an OEM guy, as opposed to customizing. But I heard about it! It seems Carter used a different rod for leaner elevations, not a different jet. Maybe they all did, maybe some changed jets, maybe some changed both. To me it doesn't matter, just that Carter YF 938SD has one and two steps lean rods using the same jet. And my extra custom rod happens to be just what I might need for my elevation. At least I'm going to try it. That's what I stumbled upon as a result of computing all my "areas". I came in the back door. I was trying to determine "area available for fuel flow between the jet and each rod step", because yes, I was going to mix and match - if I could... there, I said it! That was figuring area of the jet, area of the rod steps and subtracting the step figure from the jet figure for the difference (fuel flow area). Here's what I got when I calculated using my custom rod with the SD jet - and these figures are in "area", not diameters, as we may be used to seeing on the spec sheets. The comparison was so close, I looked closer at the custom rod size as compared to the 938SD one step lean size and that's when I determined the custom rod was somebody's attempt to make a 938SD one step lean! It was a long way around, but how are you going to conclude what you need to know until you've gone through a process? And who knows what the process is until you at least start one? Incidentally, the custom jet is diameter .081, which is pretty small! Compare that number to the other jets found in various Carter YF 938 series carbs of a range from .091-.096 and the 938SD which is .0935! I don't know why that jet is so small. One possibility is that it's shipped small for a customer final choice in drilling. I don't know. But only through doing all the math, and through thinking hard on what the math results showed, was I able to even conclude the jet was too small. Others (like oldtime or scoutpilot for example) have probably been so involved in such thinking for so long that it is a second nature sort of awareness to look at certain numbers and see specific answers without doing complicated math. And once more, this is a fine time to say, don't mix and match. Keep your jet and rod within the same calibrated pairing that they were designed. Unless, you know what your doing (not saying I do). But I'm going to try this custom rod (which I will re-state is actually a one step lean for the jet I'm using). Maybe we'll get Lil' Willy some greater pep. Maybe some better mileage. Maybe a hotter burn and less sooty plugs. This has been fun. "Happy Wheeling!" Scoutpilot: "I've got to hand it to you Dave. In learning, youíve shared. In that sharing, you have learned. That's exactly how it's supposed to happen around here. And everywhere, for that matter. Thank you." Dave: Thanks. And thanks for the support and extra information. So today the UPS guy swung by and wished me Merry Christmas and gave me my carburetor rebuild kit. So I also completed the rebuild today (before I got the kit) and stuck the custom metering rod in place and made my adjustments, and reused the gaskets - again - and went for a test drive. Yup, it was noticeable. Peppier, and better bottom-end when the throttle is open. I liked it. I'll watch the plugs and locate that littler miss in the ignition and pull the heater core, and... well you know. It's the Hygrade 518C, the one oldtime says is a good choice. I was just reading the kit paperwork. I found this Carter YF rebuild kit can be used for cars and trucks of quite a number of manufacturers as far back as 1932 and as recent as 1979! My phone is 3 years old and it's considered an antique. Oldtime: "Yes it certainly appears that the custom rod is nearly identical to 1 step lean. The .001 thousand inch variation could be caused by many things. Tool calibration and even the air temperature can effect the readings that much. I have no idea why the custom jet is so small. Glad you got it installed and running Dave. Should be nearer to ideal for your elevation." SteveK: "Excellent info and advice. This has been very helpful on a complicated subject, especially the pics with the description. Thanks! Since we went to different schools together, I think there is one mathematical correction. I think it should be Pi 3.14 X (R-squared), squaring the radius first, then times Pi. I hope Derek keeps this thread and others in his archive. Excellent stuff all! I learn something here every day." Dave: That's right SteveK, thanks. So all those flow numbers are wrong, but the high/low relationship is still there. Good catch! One more thought here for those of us at high altitude. 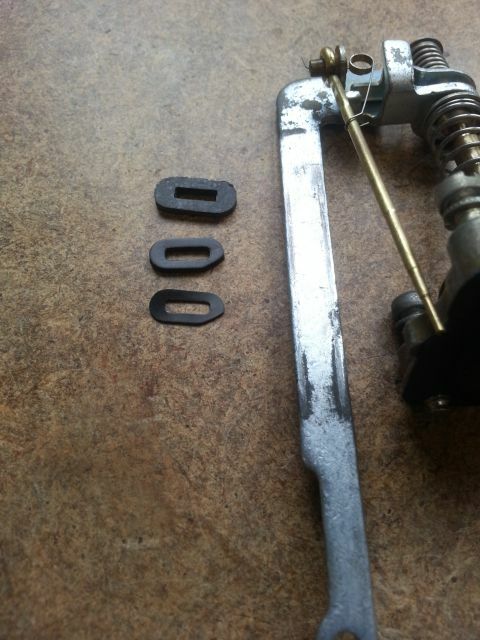 Note the standard rod for a 938S carburetor (75-806) is quite similar in size to the 938SD one step lean rod (75-1570). Slightly less fuel in econo and midrange with that older standard rod - closer to E.073 and M.067 of the 938SD two step lean rod, making such a swap even MORE appropriate to a high elevation run (can you say Colorado Rockies?) or for someone in the... say 6000'-13000' live and play range. That might prove beneficial to those who want to re-calibrate their 938SD for a higher elevation! A standard 75-806 might be easier to locate than a 75-1570, especially because the 938S carbs may have been upgraded to the arguably better 938SD over the years, making their 75-806 unused. Return to A Tale of Two Carbs, Part 1 on CJ3B.info. See also YF Carburetor Tips and the Carter YF Carburetor Documents on CJ3B.info. Return to CJ-3B Specs and Tech Tips.